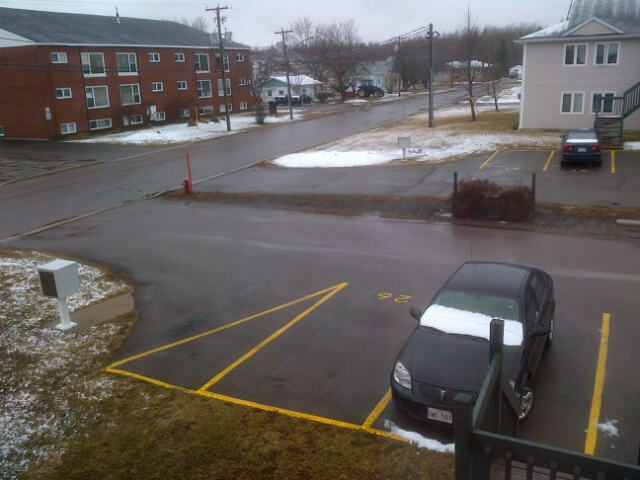 April 2013 proved to be fairly typical in Greater Moncton as the first full month of spring. Temperatures were cool especially overnight during the first half of the month but daytime highs rebounded during the second half with a record high on the 19th. Normally the month tends to be fairly wet but rainfall was below normal and snowfall was well below normal which meant for a slow greening up period. 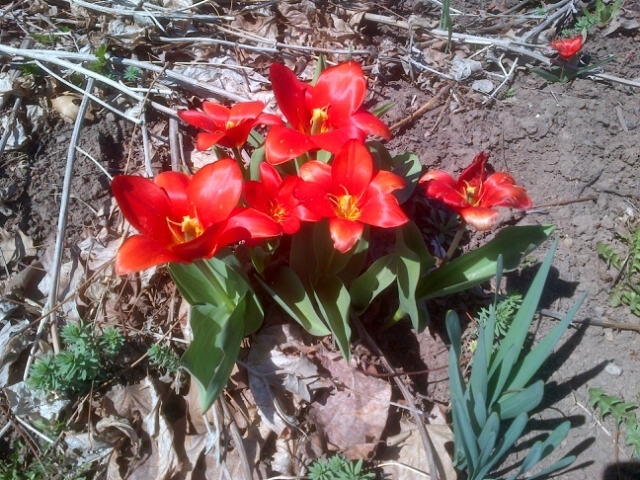 For the first time in recent memory, both Saturday and Sunday in Greater Moncton were mostly sunny with seasonable daytime temperatures ranging from 10 to 15°C. 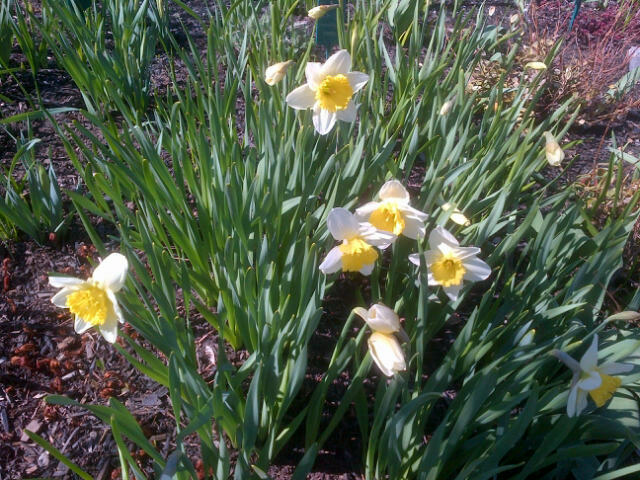 The daffodils are up, the tulips are next and most trees are now budding which means it won’t be long before we see leaves again. Today was also warm enough to get a sun tan which many were doing including me! 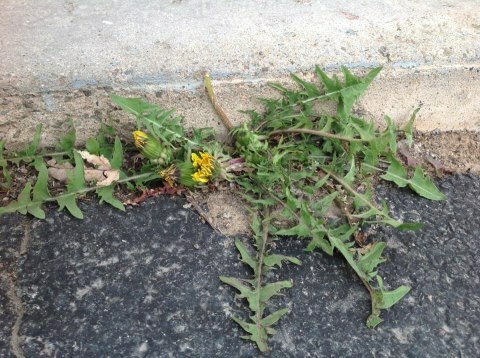 Ah yes, the dandelion may be among the most dreaded weeds we have in New Brunswick but seeing one means that spring must be here. Also this week in my Moncton neighbourhood, I’ve been hearing the peepers (frogs) in the evening which is another sure sign the season is now in full swing. Finally a warm day in Moncton and record warmth to boot! Environment Canada reports the Greater Moncton Airport reached a high of 20.2°C yesterday – just enough to break the old record of 20.0°C from 1987. Incredibly it was the warmest day since 31 January when the thermometer hit 14.1°C. Miramichi was the hotspot in New Brunswick at 21.1°C while it was even warmer in Nova Scotia with a record high of 23.6°C in Kentville. 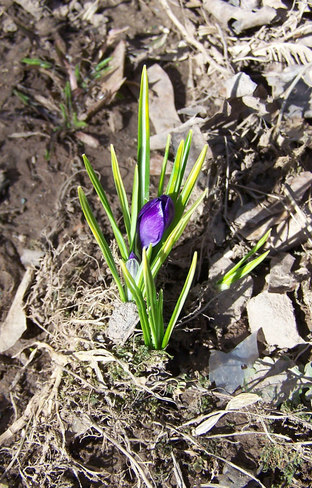 Have we turned a corner – could real spring weather finally be here? 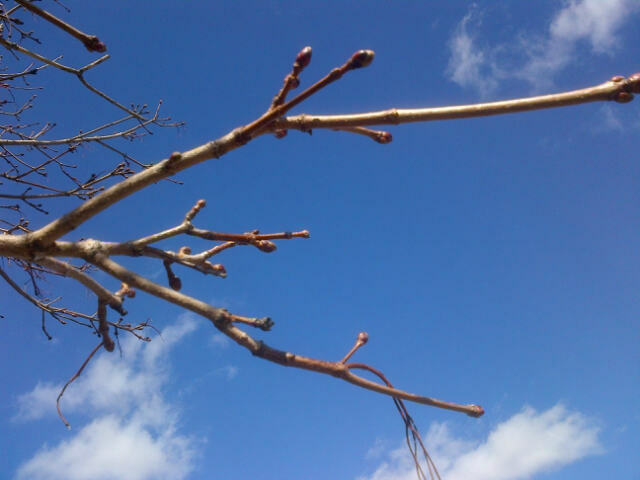 Trees have started budding – albeit slowly – as you can see from the above photo taken at Moncton’s Riverfront Park today. Temperatures have been near normal over the last few days and Environment Canada is calling for a high of 18°C by Friday. It would become the warmest high of 2013 so far – the last time it was that warm was 31 January when Greater Moncton reached a balmy 14.1°C! Snow is by no means unusual in mid-April in Greater Moncton given that the monthly snow average is 35 cm. It began snowing Friday night and the snow continued off and on throughout the weekend. However the total over two days was about 8 cm and the snow didn’t stick to paved surfaces only to grassy areas. Given that the ground is warming and that there is little to no frost left, the snow melted rather quickly and is now just a memory. Environment Canada has issued a snowfall warning for Southeast New Brunswick and is forecasting up to 15 cm of snow by Saturday night. 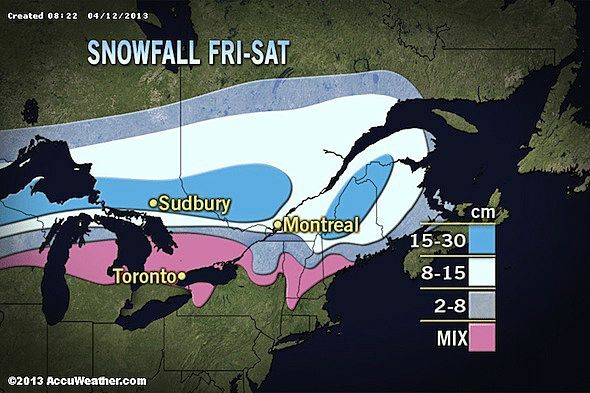 Accuweather is forecasting up to 8 cm of snow for the region as the map above suggests. 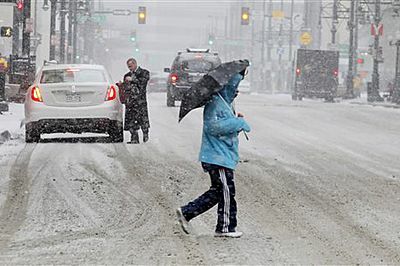 The return of winter is thanks to a low pressure system which has been wreaking havoc across the continent this week. The system dropped snow and freezing rain today over Southern Ontario making roads messy for drivers. 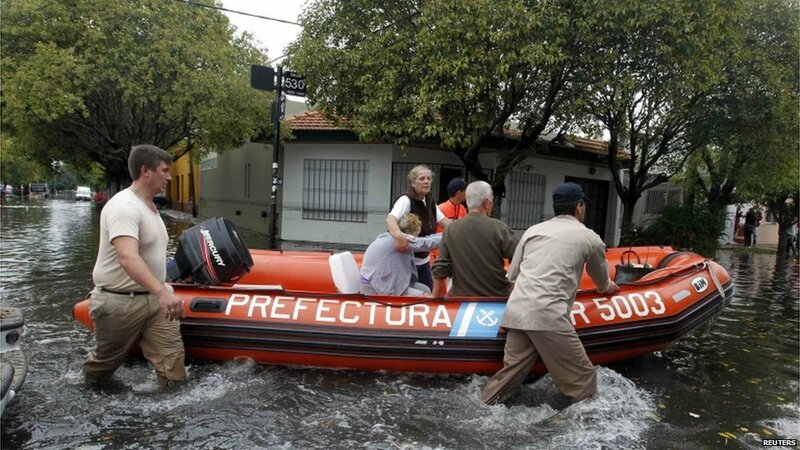 More than 55 people have died in eastern Argentina after torrential rains caused major flooding in the capital of Buenos Aires and the nearby city of La Plata. Forecasters say more than 400 mm of rain fell in just a few hours in La Plata – which is about six times the normal amount for the entire month of April! Many drowned in their own homes and cars, were electrocuted or died from other accidents related to the flooding. Thousands more lost power or had to be evacuated from their homes. It didn’t feel much like spring this morning in Greater Moncton with a temperature of -7°C and a wind chill as low as -16. Today’s daytime high barely got above freezing with another cold night ahead. A blocking high pressure area in the Arctic is pushing the jet stream south allowing cold air into Atlantic Canada. The normal high for the first week of April is 7°C with the low being -3°C.